Leather sofas to Handmade bags! Today I've got a real treat for us, an interview with a celebrity! 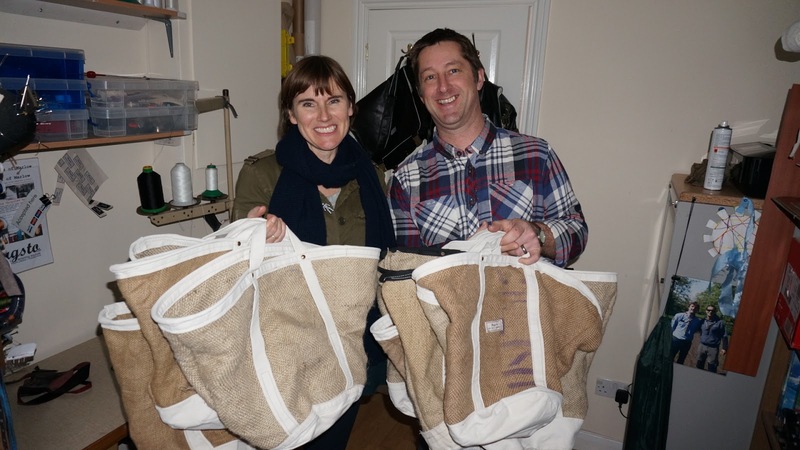 Neil from Ragsto has recently been featured on BBC TV's Money For Nothing as their expert for turning unwanted materials into something incredible! His gorgeous up-cycled leather handbags caught the eye of my sister, and office manager Amanda, who is always looking for incredible things to share with us! Scroll down for an insight into making handmade leather bags from unwanted materials! 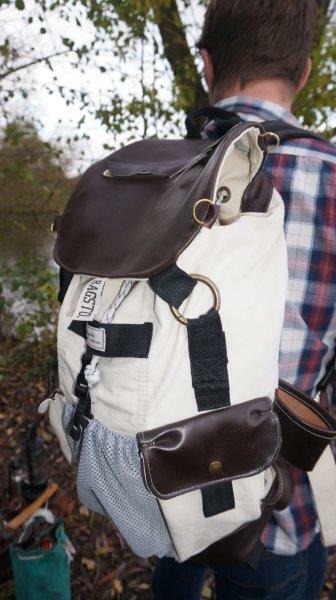 Hi Neil, Would you mind telling us a little about the bags that you make, and how you came to start making them please? I make, or rather I recreate bags and luggage from unwanted, discarded or pre-used fabrics. Think former canvas bell tents, army & scouting tents, leather sofas, leather motorcycle jackets, tweed skirts, curtains or upholstery fabric, inner tubes from Land Rovers and bicycles or even hang-glider harnesses! I have sewn for a long time, originally it was by hand and simply to repair camping kit such as rucksacks, bags and camp beds. It was all rugged kind of kit that I made or repaired. My outlook is that we throw away too much, much that can be reused or re-fabricated with some skill & imagination. No-one wants a house full of re-used items that makes your house look like a rubbish tip, so people like myself and the other artisans that appear on BBC TV’s Money for Nothing program turn rubbish into exquisite, boutique or high street quality designer items. Could you tell us a little about yourself, do you have any formal training, how did you learn to sew, and do you have any spare time?! I have never had any formal training, it’s all been a case of step one - I want to do it, step two - how do I do it! In fact after making lots of bags I decided to try and a garment from a pattern so I popped into my local haberdashery, Lady Sew & Sew in Marlow and asked for a pattern to make a shirt and all the fabric and notions to go with it. Looking at the back of the pattern for the first time was like reading hieroglyphics! With a little perseverance though I found that if you do as you told, you end up with something that looks good, fits and has been made by your own hands! That’s the motivation for Ragsto Bags, the passion for creating something unique. Even if the bag forms part of a range, each one has it’s own back story and personality. In addition to making all the Ragsto Bags by hand I also provide IT Services such as web design and support for local businesses here in Marlow, the sewing fills the working day. 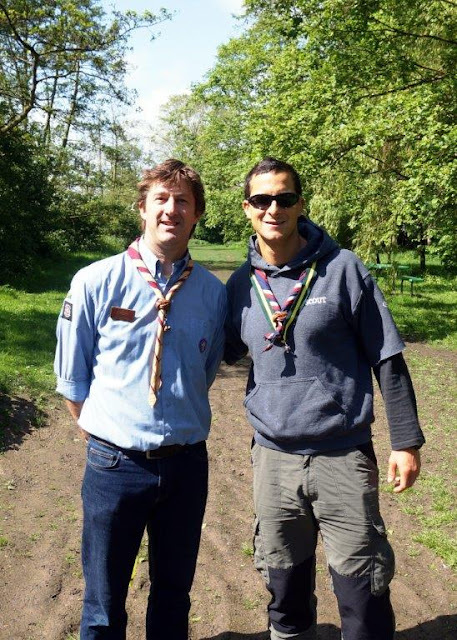 Spare time is spent with my family and I am also a Scout leader in Marlow. I enjoy cycling, camping, surfing and a bit of whittling. Once my family were fully kitted out with a leather bag for every occasion, it was then, a few years ago that I decided to create Ragsto Bags the company! What machine/s do you use to create your bags, and what would you recommend to someone wanting to work with up-cycled leather? I have four machines altogether but one is a backup and one is an overlocker which aren't used much. I have two machines that I make all the bags with, a ‘light saber’ and a ‘blaster’. That’s their nicknames! The ‘light saber’ has a more civilised aim, it’s a Janome which I use for the standard fabrics or I need a zig-zag or fancy pants stitch. My other is the ‘blaster’, this is fantastic, it’s an industrial Pfaff from Germany, is brown, probably older than me and will punch through anything, even plywood! 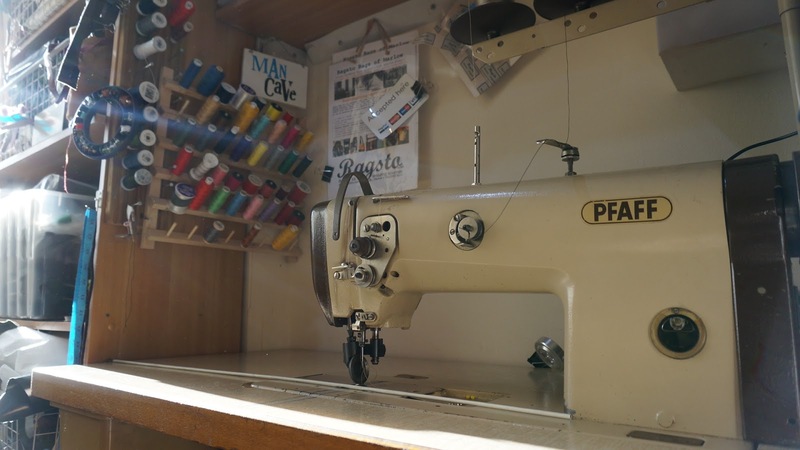 It doesn’t have a presser foot just two motorised rollers so the needle is always exposed and can stitch right along the edges or sew heavyweight threads and leather. I’m mostly using a 140/22 needle for example. If you want to work with leather then even a basic machine will do it but, it’s all about the number of layers and that is where the difficulties start to arise. For instance a simple, unlined duffle bag from a supple, clothing weight leather can be sewn by almost any machine I guess. However, when you start to use thicker upholstery leather, such as the leather taken from the back of a sofa which is usually untouched and fairly stiff and then you double it up and add another two layers of thick army canvas you do need something industrial. My Janome is a good ‘prosumer’ machine but I have broken it trying to get it to do too much in the past! An industrial machine needn’t cost any more than a good home machine but you have to scan the online auction sites, second hand sites or the reconditioned ones. I bought mine from a company who restored classic car interiors but was closing down. I do love my Pfaff, no reverse, no zigzag, nothing fancy but it’s very predictable and the resulting bags aren't let down by either machine nor maker! How does your business work, do you run it full time, or slot it around other work commitments. Do you work with family? Around the making of kit for Ragsto Bags I will help out local businesses with some IT support and creating websites. Do you have any tips for someone who would like to set up their own business selling their hand crafted bags? Get a good website with lots of nice pictures, chat and expose yourself on social media and start with markets where you can talk directly to potential customers. After a while people send you ideas, inspiration, raw materials, commissions and advice. You will find out what doesn’t work for you, for example school fayres might be a waste of time whereas talking to High Street shops might not be. On the other hand the opposite might be what works for you but you’ll only find out by trying it out. The best part is when the finished bag is so nice I want to keep it, the next best part is when someone else values it more! The worst part is like any business, the admin side of things when you are not actually being either creative or productive, eg: vat returns! Frustrating parts are also sewing a long neat line and then finding out you ran out of bobbin thread before you even started! If that was the worst part of sewing for a living then to be honest, it’s a charmed life! Other great feelings are when customers send you something cherished and I turn it into something new. I was sent a leather jacket, for example from a girl who spent her gap year travelling the world in it twenty years ago. She hadn't worn the jacket since but, obviously, also hadn't thrown the jacket away. She couldn’t bear to part with it but couldn’t bear to throw it so she sent it to me and asked if I could make her a bag. She didn’t know what kind of bag just could I do anything with it? I created a ‘chuck everything in’ style shoulder bag, something that wouldn’t replace her handbag but would take a jacket, umbrella, groceries or lunch and she loved it! In her words she said, ‘wow, I can wear my beloved jacket again, every day! I love it!’. That was pleasing. Same as now, what to make that everyone (& I mean everyone on the planet) loves, and how best to get them to market. Still learning! Right now, outside. It’s sunny. I hear you Neil, it's sunny here too (for once!). If you've enjoyed reading more about Ragsto and want to find out more, you can find them on Facebook or Twitter , and of course you can pop over and check out their store.